Join your peers in San Antonio April 15-17. Hear from leading senior living executives and dynamic keynote speakers, and engage with solutions providers at the Senior Living Expo. 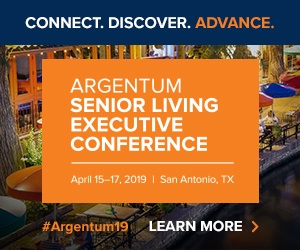 Attending the Argentum Senior Living Executive Conference this April in San Antonio is sure to provide you with unique insights, actionable takeaways, and opportunities for growth—both for your company and for your career—whatever your unique role may be. In a program driven by the new Senior Living Executive Conference Planning Committee, you’ll hear from thought leaders from inside and outside of senior living. They will address the biggest challenges, evolving opportunities, and increasing trends facing the industry today and in the near and long term. Mainstage and Insights From the C-Suite panels, moderated by Ann Compton, former ABC News White House correspondent, will tap into the experience and expertise of executives across senior living. The State of the Industry panel will address achieving operational excellence, obtaining strategic scalability, and winning the talent wars; The REIT Landscape panel will focus on how increased demand and innovative joint ventures may create opportunities for growth; and the Focus on the Workforce panel will dive into strategic approaches to workforce development and the measurable outcomes driving long-range success. Featured Panelists: Scott Brinker, EVP & Chief Investment Officer, HCP, Inc.; Tom Grape, Chairman & CEO, Benchmark; Kai Hsiao, CEO, Eclipse Senior Living; Eric Mendelsohn, President & CEO, National Health Investors, Inc.; Joel Nelson, President & CEO, Life Care Services; and Patricia Will, Founder & President, Belmont Village Senior Living. Additional mainstage panels will address the integration of healthcare and senior living policy with featured panelist Michael Leavitt, former governor of Utah, and tackle emergency preparedness strategy and response with featured panelists John Moore, Chairman & CEO, Atria Senior Living Group and Bill Sciortino, COO, Vi. Specialized trackshave also been designed to support the specialized roles of senior living professionals: HR/workforce, memory care, operations, sales & occupancy, finance & development, and risk mitigation & cost containment. Featured Panelists: Adam Brooks, Director of Accountable Care, BAYADA Home Health Care; Emily DeRocco, CEO, E3; Chris Guay, President and CEO, Vitality Living; Chris Hyatt, Partner & COO, New Perspective Senior Living; Jessie Marinko, CEO & Founder, Phoenix Senior Living; Nicole Moberg, Chief Sales Officer, Thrive Senior Living; Lana Peck, Senior Principal, NIC; Rob Poyas, VP of Sales & Marketing, Five Star Senior Living; Jason Rock, VP of Sales & marketing, Allegro Senior Living; David Smith, Founder/Owner, The Gatesworth Communities and Sherpa; Rick Westermann, VP & Senior Director of Sales & Marketing, Life Care Services; and Shamim Wu, COO, Eclipse Senior Living. New this year, Deep Dive sessions will highlight critical and emerging issues from quality care and workforce development to dining strategy and women’s leadership. Hear from featured speaker, Sarah Thomas, the first NFL referee, during the Women in Leadership Deep Dive on how she broke through a traditionally male-dominated industry. Featured Panelists: Tommy Comer, Chief HR Officer, Commonwealth Senior Living; Sue Coppola, SVP of Care, Sunrise Senior Living; Dr. Patrick Doyle, Corporate Director of Dementia Care, Brightview Senior Living; Aaron Fish, VP, Food & Beverage, Civitas Senior Living; Collette Gray, CEO and COO, Integral Senior Living; Sarabeth Hanson, President and CEO, Harbor Retirement Associates; Mary Sue Patchett, EVP, Community and Field Operations, Brookdale; Sanjeev Shetty, Head of Innovation, The Asbury Group; Cooper Vittitow, COO, Civitas Senior Living; and Judy Whitcomb, SVP, HR and Learning & Organizational Development, Vi. Peer-to-peer discussions in The Hive will also allow participants to explore topics including design, legal/compliance, marketing and social media, workforce, mentoring, and technology in an open forum. Among the notable speakers joining us on the mainstage, Dr. Daniel Levitin, neuroscientist, musician, and author, will share his expertise on music and the brain. Kat Cole, President, North America, FOCUS brands, will share her experience building highly successful and resilient brands; and Kim Campbell, an advocate for eradicating Alzheimer’s disease, will share details about her husband Glen Campbell and his courageous battle with Alzheimer’s. Not to be missed during the conference are the invaluable networking opportunities to be found at the Senior Living Expo and special conference events. More than 250 exhibitors will be on the show floor ready to share the latest innovative solutions and to address your most pressing questions at focused info sessions throughout the conference. On the expo floor, you’ll also experience an exciting live culinary cook-off featuring some of the industry’s leading community chefs. Plus, there are plenty of special events where you can mix and mingle with your peers—the opening night Fiesta NIOSAITA at Sunset Station featuring Tex-Mex fare, cocktails, and a mariachi band; the Advocacy Fund Golf Classic to support issue lobbying; morning wellness activities to get your day started right; and special receptions. Finally, if you are a community executive director or administrator, take advantage of the popular Executive Director Leadership Institute—an intensive three-day course focused on effective community leadership and efficient operations—where you can earn up to 17.5 NAB CEUs. There’s also a CDAL prep course and offered Sunday, April 14 prior to the official conference opening, for those looking to take the next step in obtaining the Certified Director of Assisted Living credential. Visit our website to register and plan your agenda ahead of time! Use Promo Code SLE2019 for $50 off a Full Conference Pass and join nearly 2,500 of your peers in San Antonio. Valerie works with marketing and social media. Outside of work, she enjoys watching youtube, going to concerts and keeping up with all Cleveland sports teams.